The Mad Daddy Rides Again! In the late ’50’s and early ’60’s, the citizens of Cleveland would tune in late at night to hear the rhyming ravings of a real radio genius, The Mad Daddy! Using sound effects on record, a reverb machine, various tape effects, and a stack of records from groups that were not getting regular airplay, he would get on the air and present two and a half hours of some of the most inventive radio you’ve every heard. And, in an instant, he was gone. This show is a small gesture toward recreating what a real Mad Daddy show must have been like, using a variety of materials and sources that I dig up just for this broadcast. Special thanks go out to the excellent archivist and blogger, Kogar The Swinging Ape (the one responsible for the Lux & Ivy compilation series), and the “Salad Days” radio program, which did an excellent tribute show at the beginning of 2010. Both websites helped lead me in the right direction when I was trying to assemble this broadcast, and both led me to recordings and songs that I was unaware of before I had this idea for a show. In particular, Kogar posted on his blog a recording of an acetate that contained recordings of the sound effects that Mad Daddy used when he was on the air. Those are sprinkled liberally throughout this show. There is something wonderful about listening to The Mad Daddy in action, that I have never heard on any kind of radio before or since. His rhyming weirdness, his theatrical enthusiasm, and the creepy undertones of his weirdness, have all the hallmarks of a good Horror Host, and in many ways he invented the form. This isn’t exactly “creepy” or “spooky,” but definitely has a retro feel that fits the nostalgia that is common around this time of year. Plus: his raps are fantastic. All improvised, and well worth the time and energy. 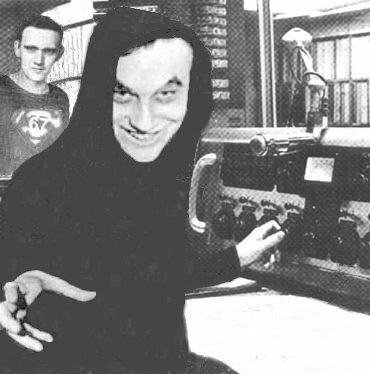 Stay tuned, as next week we’ll feature his apprentice, Ghoulardi! Enjoy! Next > The Ghoulardi Show!